Tesla's long-term chart looks stellar this summer. Things could get rougher still for short sellers. Shares of Tesla Inc. (TSLA - Get Report) have been on a tear in recent sessions, rallying more than 13.24% since the calendar flipped to June. That surge higher has brought shares back into positive territory year-to-date, much to the chagrin of short sellers. Tesla, after all, is the most heavily shorted stock on the U.S. market right now, as scores of short sellers bet on this stock to fall. That hasn't been such an easy bet to make. According to S3 Partners' Ihor Dusaniwsky, Tesla bears are sitting on nearly $5 billion in mark-to-market losses since 2016, a number that's sure to grow materially if Tesla can hold onto today's almost 4% upside move into the end of today's trading session. And things could get rougher still for short sellers. That's because, long-term, Tesla's primary uptrend is alive and well. To figure out how to trade shares from here, we're turning to the chart for a technical look at where Tesla's price trajectory has shares pointed this summer. Most investors probably haven't looked at the chart above. 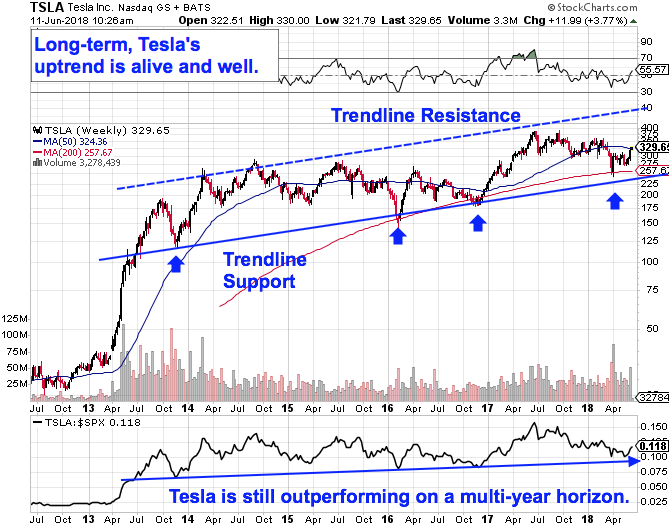 It shows Tesla's long-term price action stretching all the way back to the end of 2012. Each bar on the chart represents a full week of trading. It doesn't take a trading genius to figure out that Tesla's been bouncing its way higher in an extremely well-defined uptrending channel since the middle of 2013. Or to figure out that Tesla's long-term uptrend is alive and well here. Every successive test of trendline support since late 2013 has been met by a reaction higher; so, as Tesla bounces off that trendline support level for the fourth time in five years, history suggests that shares are likely to see buying pressure. That's confirmed in part by relative strength, the indicator down at the bottom of Tesla's price chart. That indicator measures Tesla's performance vs. the broad market, and the fact that it's holding onto an uptrend of its own here is a signal that Tesla continues to beat the broader market despite some weakness on an intermediate-term timeframe. Shares broke out above the $310 resistance level that we've been watching for the last month or so. 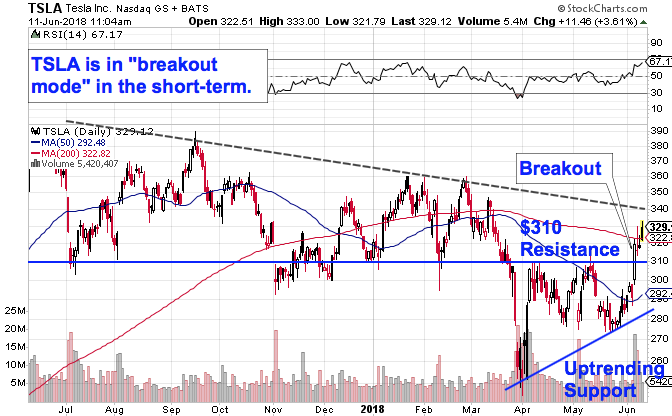 That breakout opened the door to more upside, and a test of the intermediate-term downtrend that identifies the top of Tesla's correction up at $340. If Tesla can muster the strength to push through $340, expect the uptrend to accelerate materially. In the meantime, buyers are back in control of things in the short term.